There are many indicator and index groups in the symbol catalog. Chartists can easily distinguish these because their symbols begin with either a Dollar Sign ($) or an Exclamation Point (!). The articles below highlight the different groups so StockCharts users can make the most of our website. Each article explains the grouping, shows an example chart and provides symbol examples. The articles also contain links that chartists can use to see a current list in our symbol catalog. When looking at the data sets, note that StockCharts uses a three-step process to calculate breadth indicators based on stock indices or ETFs. First, StockCharts maintains component lists for these indices. Second, our scan-engine uses these component lists to run scans based on the price data for the individual stocks. Third, the data is then updated and published to our website. Note that there are sometimes multiple sources for the same data series, such as new 52-week highs on the NYSE. The data at StockCharts may differ from other sources for two primary reasons. First, there may be differences in the index components. Index components change and require updates on a regular basis. Second, there may be differences in the open, high, low, close and volume data for an individual stock. StockCharts uses dividend-adjusted data for its calculations, while other sources may use non-adjusted data. Advance-Decline IndicatorsAn indicator group that covers advances, declines, net advances, advancing volume, declining volume and net advancing volume for five major stock exchanges (AMEX, CDNX, Nasdaq, NYSE, and TSE). Examples: NYSE Advance-Decline Issues ($NYAD), $Nasdaq Advance-Decline Volume ($NAUD). Bloomberg Commodity IndicesAn index series that covers individual commodities and commodity groups. Examples: Bloomberg Energy Subindex ($BCOMEN), Bloomberg Industrial Metals Subindex ($BCOMIN). CBOE Indices and IndicatorsA group of index symbols based on options. These include buywrite indices, volatility indices and put-call ratios. Examples: DJIA Buywrite Index ($BXD), Crude Oil Volatility Index ($OVX), Nasdaq 100 Volatility Index ($VXN). CME Futures and Spot PricesPrices for select futures contracts traded through the CME Group. There are also some continuous contract commodity prices with long price histories. Examples: Continuous Copper ($COPPER), Continuous Gold ($GOLD), Light Crude Futures Aug 2014 (^CLQ14). DecisionPoint Sentiment IndicatorsSentiment indicators from AAII, the CBOE, NAAIM and Wall Street Sentiment. Examples: AAII Bulls (!AAIIBULL), AAII Bears (!AAIIBEAR). Dow Jones Breadth IndicatorsNew highs, new lows, net new highs and the high/low ratio for the AMEX, Nasdaq and NYSE. Examples: NYSE New High/Low Ratio ($NYHLRDJ), Nasdaq New 52-week Highs ($NAHGHDJ), AMEX New 52-Week Lows ($AMLOWDJ). Dow Jones Global IndicesAn index series that features world stock indices, geographic regions, country indices, global sectors and more. Examples: DJ Germany Stock Index ($DEDOW), DJ Chile Stock Index ($CLDOW), DJ Global Index ($DJW). Dow Jones Select IndicesAn index series that limits the weightings of its components to ensure diversity. Examples: DJ Canada Select Value Index ($DJCASV), DJ US Select Micro-Cap Index ($DJSM). Dow Jones Titans IndicesAn index series that measures the performance of the largest components within a group. Examples: DJ Sector Titans 30 Index - Banks ($DJTBAK), DJ Global Titans Index ($DJGT). Dow Jones US IndicesAn index series that breaks the market down into broad stock indices, style indices, industry indices and sector indices. Examples: DJ US Internet Index ($DJUSNS), DJ US Retail Index ($DJUSRT). Economic IndicatorsA selection of economic indicators with weekly or monthly data. Examples: Initial Jobless Claims ($$UNEMPCIN), Industrial Production ($$IPI). ICE Futures and Spot PricesPrices for select futures contracts traded through the Intercontinental Exchange. There are also some continuous contract commodity prices with long price histories. Examples: Brent Oil Futures Feb 14 (^BF14), US Dollar Index ($USD). Intellidex IndicesA group of NYSE Euronext indices that employs a quantitative model to find stocks with best prospects for capital appreciation. Examples: Dynamic Oil Service Intellidex Index ($DWO), Dynamic Software Intellidex Index ($DZC). MSCI IndicesAn index series that covers developed and emerging markets outside the US. Many MSCI indices are used as benchmarks for fund managers and ETFs. Examples: MSCI Emerging Markets Index ($MSEMF), MSCI Mexico Index ($INW). New 52-week Highs and Lows for ExchangesAn indicator group that covers new 52-week highs, lows and net new highs for five major exchanges (AMEX, CDNX, Nasdaq, NYSE, and TSE). This article defines the various sources and explains the different methodologies. Examples: NYSE New 52-week Highs from StockCharts ($NYHGH), NYSE New 52-week Highs from Dow Jones ($NYHGHDJ) and new highs from the scan engine. NYSE Arca Equity IndicesA group of industry and sector indices that were formerly published by the American Stock Exchange (AMEX), which is now part of NYSE Euronext. Examples: Disk Drive Index ($DDX), Gold Miners Index ($GDM), Airline Index ($XAL). NYSE Equity IndicesA group of indices based on stocks within the NYSE. Examples: NYSE Composite ($NYA), NYSE TMT Index ($NYY), NYSE Financial Index ($NYK). Philadelphia IndicesAn index series that covers select industry groups and currency crosses, such as the Gold/Silver Index and the Euro Index. Examples: PHLX Semiconductor Index ($SOX), PHLX Gold and Silver Index ($XAU). Russell IndicesA group of indices produced by Russell Investments. These include the Russell 2000 Small-Cap Index, Russell 2000 Growth Index, and Russell 2000 Value Index. Examples: Russell 2000 ($RUT), Russell 3000 Index ($RUA). S&P 500 Sector and Industry GroupsA group of index symbols that covers the sectors and key industry groups in the S&P 500. Examples: S&P 500 Energy Sector Index ($SPEN), S&P 500 Media Industry Group ($GSPME). S&P GSCI IndicesA group of commodity-based indices covering the major commodity groups. These include energy, agriculture, precious metals, livestock and industrial metals. Examples: S&P GSCI Precious Metals Index ($GPX), S&P GSCI Livestock Index ($GVX). StockCharts AD PercentA breadth indicator based on advances and declines. StockCharts calculates this indicator for over a dozen indices and ETFs, including the S&P 500, S&P 400, S&P 600 and all eleven sector SPDRs. Examples: Gold Miners Advance-Decline Percent ($GDXADP), Technology SPDR Advance-Decline Percent ($XLKADP). StockCharts AD Volume PercentA breadth indicator based on advancing volume and declining volume. StockCharts calculates this indicator for over a dozen indices and ETFs, including the S&P 500, S&P 400, S&P 600 and all eleven sector SPDRs. Examples: S&P 500 Advance-Decline Volume Percent ($SPXUDP), S&P 600 Advance-Decline Volume Percent ($SMLUDP). StockCharts Bullish Percent IndexAn indicator based on the percentage of stocks with P&F buy signals. StockCharts calculates this indicator for over a dozen indices, including the S&P 500, Dow Industrials and Technology Sector. Examples: Energy BPI ($BPENER), Consumer Discretionary BPI ($BPDISC). StockCharts Exchange BreadthA group of breadth indicators for the major stock exchanges, including the Nasdaq, NYSE and TSE. Indicators include net advances, net advancing volume and net new highs. Examples: Nasdaq Advance-Decline Issues ($NAAD), NYSE Advance-Decline Volume ($NYUD), AMEX New Highs-New Lows ($AMHL). StockCharts High-Low IndexA 10-day moving average of Record High Percent, which is based on new highs and new lows. This breadth indicator is calculated for the Dow Industrials, S&P 500, Nasdaq and several other indices. Examples: DJIA High-Low Index ($DOWHILO), Nasdaq 100 High-Low Index ($NDXHILO). StockCharts High-Low PercentA breadth indicator based on 52-week highs and lows. StockCharts calculates this breadth indicator for over a dozen indices and ETFs, including the S&P 500, S&P 400, S&P 600 and all eleven sector SPDRs. Examples: S&P 1500 High-Low Percent ($SUPHLP), Dow Transports High-Low Percent ($DJTHLP). StockCharts Percent Above Moving AverageA breadth indicator that measures the percentage of stocks above a specific moving average, such as the 50-day, 150-day or 200-day. StockCharts calculates this breadth indicator for the Dow Industrials, S&P 500, the nine S&P sectors and several other indices. Examples: S&P 500 Percent Above 200-day SMA ($SPXA200R), Nasdaq 100 Percent Above 50-day SMA ($NDXA50R). StockCharts Pseudo SymbolsA group of symbols that automatically change when the symbol in the main charting window changes. Examples: $INDUSTRY, $ONE, $SECTOR and $SYMBOL. StockCharts Record High PercentA breadth indicator that shows high highs as a percentage of new highs plus new lows. This indicator is calculated for the Dow Industrials, S&P 500, Nasdaq and several other indices. Examples: NYSE Record High Percent ($RHNYA), S&P/TSX Record High Percent ($RHTSX). 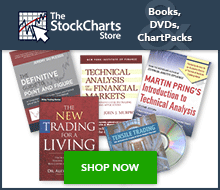 StockCharts Theoretical IndicesA group of indices that show simulated price movements. These include an Elliott Wave sequence, head-and-shoulders patterns, sine waves and a sawtooth pattern. Examples: Elliott Wave Pattern ($THEW), Head and Shoulders Pattern ($THHS). US Treasury YieldsA group of indices that cover Treasury yields across the yield curve. These start with Treasury Bills (1-, 3- and 6-month), and end with long-term Treasury Bonds (10-, 20- and 30-year). Examples: 1-month US Treasury Yield ($UST1M), 5-year US Treasury Yield ($UST5Y).